La Bague Au Roi is said to be fit and ready for the Aintree Festival next week, having thrilled trainer Warren Greatrex with pieces of work at his yard in Upper Lambourn. The eight-year-old is expect to fulfil her place in the 3m1f Betway Mildmay Novices' Chase on Friday the 5th of April, where she would line-up with many of the horses she has already beaten this season. Rated 152 as a chaser, she is unbeaten in four starts over fences, winning twice at Grade One level; once in the Kauto Star where she got the better of Topofthegame and Santini - who fought out the finish in the RSA at Cheltenham, and a victory at the Dublin Racing Festival. Her trainer stated that she is simply raring to go. (Credit: Racing Post) Greatrex said: "She's been in great form since her last victory in the Flogas Novice Chase in Ireland and is the type who doesn't require a lot of work and keeps herself fairly fit and well. "Obviously her form from Kempton looks pretty good now after what happened in the RSA. "She'll school once more and have a bit more work before next week but I couldn't be happier with her really." With Santini confirmed to be Aintree-bound for the National meeting by trainer Nicky Henderson, Paul Nicholls has yet to decide if Topofthegame will make the same journey. (Credit: Racing Post) Nicholls said: "He's cantering away and doing all the normal stuff and he could run, but we want to see what's what, and I'm not committing to anything yet." Back with Greatrex, he had a much quieter Cheltenham Festival than both Henderson and Nicholls both named - only saddling three runners across the entire week. However, he will also be looking forward to exciting novice hurdler Emitom, who was more forced to sidestep the Festival two weeks ago, after his preparation race was lost during the equine flu saga. The five-year-old; who is five from five in his career, will be aimed at either the 3m½f Sefton Novices' Hurdle or the Mersey Novices' Hurdle over two and a half miles. 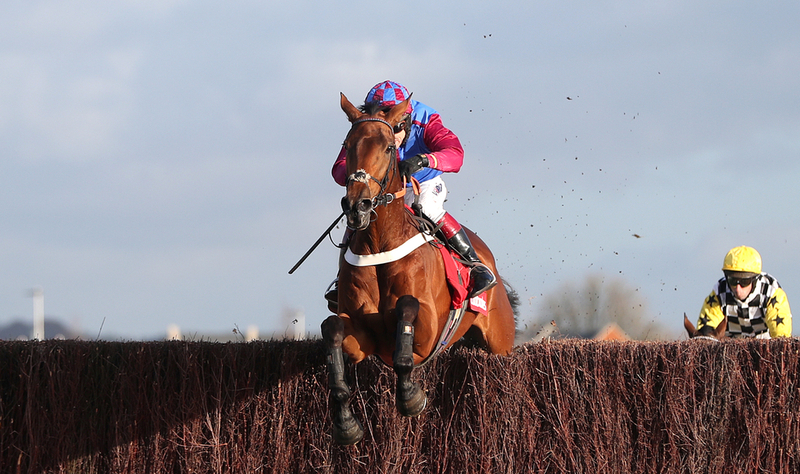 (Credit: Racing Post) Greatrex said: "I think he's actually improved again since Newbury. "To give away a double penalty in his last race was very smart and that was the first time he's actually had to get his head down and work a little bit. "I think when young horses are just winning easily they're prone to not learning much from their races. "He's done everything we've asked so far and we've minded him all season. Now it's time to see if he can win a big race."